Interesting, and instantly recognisable – what more can you ask for? These are, of course, fossilised Starfish! I’m sure most of you have some idea what a starfish is! Thats why I love these fossils – we can relate to them. There are currently around 1500 known living species of Starfish. Scientifically speaking, they are star shaped echinoderms which belong to the biological classification ‘Asteroidea’ – which, as I recently found out, comes from the Greek word for Star. They are invertebrates, meaning they do not have a backbone or spine, and instead have a hard shell or exoskeleton. Because of this, starfish are not often found as fossils, as their skeletons tend to break up as the animal decays. 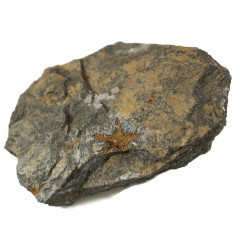 The first starfish fossils found date to the Cambrian period, 485.4-541 million years ago. Currently, a lot of the cheaper fossil starfish sold online come from Morocco. This isn’t necessarily a bad thing, but there are many, many fake pieces coming out of the country. If it looks too good to be true, it probably is! If there are multiple high quality pieces on a ‘plate’ of stone, it ought to be expensive – with a few exceptions. There are a few ways to check the Moroccan pieces, but honestly, experience is best, or buying from a trusted seller. Whether the fossil appears to be ‘3D’ – if it has some depth to it, at least it isn’t just painted on. Whether the backing matrix appears to be a true stone – nothing that could be assembled or concreted together. Does the piece have any other small fossils, such as Edrioasteroids, or Crinoids? Does the matrix have natural features, orange markings, and cracks or other damage? In short, the less perfect the piece appears to be, the more likely it is to be genuine. Spotted a mistake? Let us know! These translations are only the word ‘starfish’, not ‘fossil’ or ‘fossilised’.